How Does Cyber Acoustics Compare to the Competition? The studies have been done, and the science is solid -- listening to music while you work makes you more productive and more creative. That doesn't need to hold true just for work, either. Who doesn't get an extra pep in their step when they listen to their favorite tunes? Even video game music is beneficial because listening to gaming soundtracks boost production, as well. Some studies also show what types of music help the most. No matter where you listen, you want to have the best listening experience possible. Cyber Acoustics offers a full lineup of desktop speakers, headphones, headsets, and microphones designed for that purpose. Thousands of people have now bought and tried these products, and the reviews are in. No matter if you are gaming, working, cleaning, driving, or anything else, Cyber Acoustics makes a product that enables you to listen to music, talk to your teammates, do voiceovers, study at home, make video calls, or even do radio broadcasts. We found out the truth about how they stack up against the competition. Cyber Acoustics has been manufacturing products since 1996. The company states that its goal is to bring customers the ultimate in "lifestyles technology" at an affordable price. And from what we found, they do have a long list of affordable products. Cyber Acoustics makes desktop speakers designed to fit in small spaces and fill them with glorious sound. On top of that, there is a line of both headphones as well as headsets like one would use for gaming. The company also has a decent lineup of microphones. Cyber Acoustics offers several different types of speakers. These include a Curve Series, 2.1 speakers, 2.0 speakers, mobile speakers, Bluetooth speakers, and a new product called the dot.Boom. The only difference between the Curve Series and the other speakers is how they look. Instead of tall rectangular speakers, they are designed to look sleeker and curvier. In case you don't know, the items listed as 2.1 speakers come with a subwoofer and the 2.0 speakers do not. There are even a few speakers designed to take with you when you are on-the-go. First, we will talk about all the speakers that come with a subwoofer. These speakers have a range of power selections available. You can get a speaker starting at 14 watts of peak power and find one all the way up to 92 watts of peak power. So, depending on how loud you want your music, that's the place to start. Some of these speakers come with a control pod, others with LED lighting and a few with Bluetooth technology. The price range for these starts as low as $15 and only goes to $99.99. So, there is a set available for every budget. Next, if you need to keep the bass to a minimum, a smaller set of Cyber Acoustics speakers from the 2.0 category is what you need. You can get a pair of these speakers in the curve design or the original design that's a little boxier. There are two options in this class that aren't the traditional plug-and-play speakers -- a portable USB powered system and a USB powered speaker bar. The pair of portable speakers has a magnet on them so you can attach them for easy transport. The speaker bar is not transportable, but it's USB powered like the other set. None of the speakers in this category are Bluetooth-enabled, nor do they light up. The 2.0 speakers range in price from $15 to $45. The dot.Boom is Cyber Acoustics' newest offering for those of you who want a boost for your Amazon Echo Dot (second generation). This item is a wireless portable speaker designed to amplify your Echo Dot. You can converse with Alexa and listen to Amazon music no matter where you are in the house using a dot.Boom. This speaker is not short on features, either. For gamers, voice over artists, and students, Cyber Acoustics carries several different headsets. These headsets are all adjustable and over the ear with in-line volume control and mute button. Some of them have a boom arm capable of rotating 180 degrees. You can find a Cyber Acoustics headset in either mono or stereo. When you are looking at these headsets, be careful to remember what hardware you will plug them into. Some of these headsets come with a USB connector. Others come with a 3.5-millimeter plug and/or a Y-adapter. The microphones on these sets are all noise-canceling, and they even have a pair made just for kids. These headsets range in price from $20 to $55. If you are looking for a pair of standard headphones, Cyber Acoustics also makes those. There are two headphones available that are made just for kids and one pair for adults. All three are stereo headphones with adjustable headbands and in-line volume control. The headphones cost $15 to $30. Finally, Cyber Acoustics also offers a lineup of microphones. Some of the mics available on the website are professional USB recording mics. These microphones come with at least one pre-set polar pattern (which is how the mics pick up sound), but most of them come with more than that. These condenser microphones easily plug-and-play into a Mac, PC, or any device with USB capabilities. You can plug headphones directly into the mic, as well, with zero latency issues. These mics range in price from $40 to $200. On top of that, the site also lists a few desktop microphones that connect using a USB, as well. These mics don't have as many bells and whistles as the others, of course. But they are also much less expensive. These mics do come with noise canceling technology, an adjustable microphone arm, and PCvoiceLink technology. The desktop microphones cost $12 to $38. In this section, we will take a look at what real people say about the products. 62 watts peak / 30 watts RMS power, enough to provide rich enjoyable sound, ﬁlling even the largest of rooms in your home. Dual 2" drivers in a ﬂat panel designed satellite brings crisp accurate mids and highs. First up we are going to talk about a speaker set available on Amazon from Cyber Acoustics called the CA-3602FFP. With over 10,000 sold just on Amazon, this item seems quite popular. 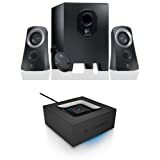 This set comes with a subwoofer, 62-watts peak power, control pod, headphone output jack on the control pod, a five-foot power cable, and a one-year hassle free warranty. The cost for this item is $35 to $50, and it's rated 3.8 out of 5 stars on Amazon. Here's what the people who bought these speakers said. Many users absolutely love the deep rich bass that the CA-3602FFP produces, and delight in the fact that the speakers are so affordable. 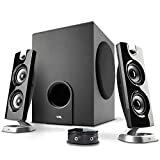 One user said they initially bought these speakers as a "cheap placeholder," but that they no longer need to spend more on another set. Another customer said that they love the adjustable bass -- not all speakers in this price range have that feature. A lot of people love how easy it is to adjust the volume with the control pod. Some users reported that the speakers stopped working after a short time. However, there are also a lot of reports of Cyber Acoustics honoring the products' warranties and doing to right thing. Another customer said that the mid-tones on these speakers are "empty" and "hollow." Finally, a few customers said that the tweeter speakers are top-heavy and too easy to knock over. USB MONO HEADSET WITH UNIDIRECTIONAL NOISE CANCELING MIC: The noise canceling microphone is designed for reliable testing, speech, and other vocal use, in less than ideal environments. IN LINE VOLUME AND MUTE CONTROL: Conveniently located inline volume and mute control makes it easy to adjust what your are listening to on the fly. USB PLUG-N-PLAY: Designed to work with standard USB ports, perfect for newer and older computers and laptops. DURABLE DESIGN: This hardwearing headset is long lasting, with an adjustable headband, easy to clean soft leatherette ear cushion for ultra comfortable fit on most any head size. Designed for daily use in schools, classrooms, or all day at work. Perfect to keep one ear free for those multi-tasking roles. QUALITY GUARANTEED: Includes 1 year hassle-free warranty. The other Cyber Acoustics top-seller we found was the AC-840 mono USB headset with microphone. 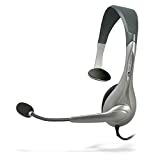 This headset has a USB connection, inline volume control and mute button, durable design features, "leatherette" ear protectors for comfort, and a unidirectional noise-canceling microphone. The cost for this product is $14 to $25, and it's rated 3.6 out of 5 stars on Amazon. Many customers seem to like this product. Several reviewers said that the reception is clear, the sound is great, and they love the ambidextrous aspect of the mic itself. Several reviewers use these microphones for various jobs from home, and they report that their customers never complain about the mic's volume or clarity. Another customer liked how sturdy the headset is. Several negative reviews report that this headset was just too tight and stiff. So, if you have a head on the large side or you don't like your headset to fit tightly, this might not be for you. A few customers noted that the microphones would not work with their computer. And several others reported that the mic stopped working altogether after a short time of use. Remember, though, that by all reports Cyber Acoustics will honor the one-year warranty and get you up and running again quickly. Before we let you go, we will do a final tally of all the pros and cons of the Cyber Acoustics product line. In this section, we will compare one of the speakers from Cyber Acoustics to the same type of speaker from three other manufacturers. We read reviews on Amazon and other sites to bring you the lowdown on these speakers. For our purposes today, we will use the same speaker we spoke of earlier, the CA-3602FFP. First, we will compare the CA-3602FFP from Cyber Acoustics to the Z313 from Logitech. The price point on these speakers is nearly identical. The Logitech speaker costs $32 to $45. Remember, the Cyber Acoustics item scored 3.8 out of 5 stars. The Logitech speaker scored 4 out of 5 stars. Let's take a look at what the Logitech speaker has as far as features. The Logitech Z313 has a control panel, as well, with a headphone jack and volume control. Additionally, the Z313 has 25 watts of peak power, which is lower than the Cyber Acoustics version at 62 watts. The Logitech speakers are smaller than the comparison model. So if you are working with a tight space, keep that in mind. As far as specs go, these speakers are neck and neck. 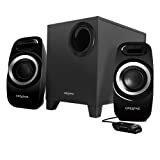 One of the first reviews we found was from an individual who replaced a Cyber Acoustics set with the Logitech speaker. They said that the sound between the two was comparable, and the only reason they favored the Logitech speakers was that they don't tip as quickly as the Cyber Acoustics do. Much like the CA-3602FFP, the Z313 has a lot of reviews stating that people can't believe how good it sounds for the price. Again, people like the Logitech's little control panel. Also, very much like the speaker from Cyber Acoustics, there are a few customers that experienced equipment failure early with the Z313. Unlike Cyber Acoustics, though, Logitech does not have many positive reports concerning customer service. Second, we compared the Cyber Acoustics speaker to the Arion Legacy AR504LR-BK. The Arion speaker is bigger than both of the speakers we spoke of before. However, the Legacy also packs a punch in the power department with 70 watts of peak power. The Arion speaker has a remote control instead of a control pod -- which means you don't get to plug your headphones into the pod. The Arion is a little more expensive and costs $40 to $50. It is rated 3.5 out of 5 stars on Amazon. Like Cyber Acoustics, there are plenty of reviews stating that the sound is fantastic on the AR504LR-BK. Many users seem delighted with their purchase of the Arion speakers. However, there are a lot of reviews that speak negatively about the quality of Arion's offering. 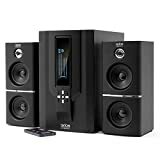 There are significant concerns with the quality of these speakers, even more so than with the other two judging by the sheer number of negative reviews. The number of positive vs. negative reviews is almost even. Unlike Cyber Acoustics, many users report that Arion customer service is extremely lacking. Finally, we compared the Cyber Acoustics speaker to the Creative Inspire T3300. The T3300 comes stacked for sound but compares in size to the Logitech speakers, slightly smaller than the Cyber Acoustics. The T3300 comes with a control pod, but it does not have a headphone jack. The price point for the T3300 is a little higher than Cyber Acoustics and ranges from $45 to $55. The Creative Inspire scored 4 out of 5 stars on Amazon. As we said, the T3300 is built to sound good. Where some people didn't like the mid-ranges with the Cyber Acoustics version, that is not an issue with the T3300. However, a few reviews did state that the bass on the T3300 is a little weak. So, if you are into the loud boomy bass sounds, the Cyber Acoustics is the way to go. Though, just like with the other items we look at, there are several complaints about the Creative Inspire speakers wearing out entirely too soon. We could not find any information on Creative Inspire's customer service. It's time to turn it up and let the music heal your life. Let's face it; when you buy an item at a budget price, it can be risky. Most of us need to save that money, so then we figure out if it's worth the risk. That's why we talk to you about customer service. Cyber Acoustic's customer service is reportedly top-notch so that should ease your mind before you decide to take the plunge. While you may get a product that came off the line a little banged up -- the company will make it right. Now get cracking, get creative, and get to work. Previous articleAKG D5 Dynamic Microphone Review: Should You Buy? Shure SM58S Review: Is It the Best Live Vocal Dynamic Mic?